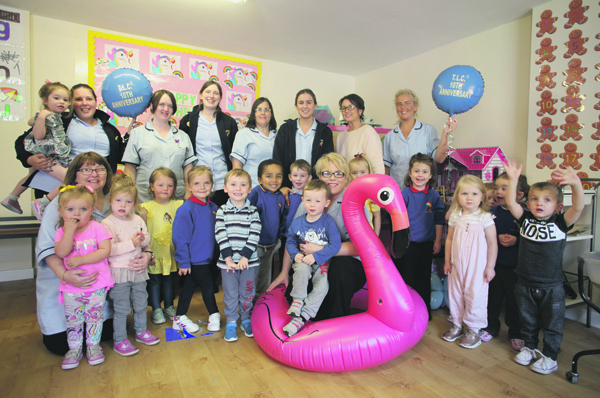 TENDER Loving Childcare (TLC) is celebrating their tenth anniversary offering childcare services to the North Belfast community and beyond. The Cavehill Road-based nursery offer an extensive childcare service including a nursery, playgroup and pick-up/drop-off service using their own minibus. Christine Singh, who runs the service explained more about Tender Loving Childcare (TLC). “We still have some staff with us ten years on. We don’t have a great turnover of staff but the girls are all great team workers and enjoy their working environment. “Some of our children we have cared for over the years are ten years old now and have built up great relations over the years. “We are also proud to have won ‘Best of the North 2017’ winners for ‘Best Creche’ and we were over the moon at this great achievement. “We have also extended our services by offering TLC playgroup which is Pre-School Education Advisory Group (PEAG) funded by the Education and Library Board which has been a great success. “We are in our fourth year running and recently received a great Education Training Inspectorate (ETI) report. “We offer our playgroup times from 8.30am-1pm each day with a hot lunch included and our service is open to all the community. “We also provide childcare provision from 7am-6pm Monday to Friday with afterschool pick-ups from all local schools at competitive prices. “We would like to thank all the parents who have supported us over the years and also to the people in the community who deliver fresh fruit and vegetables from Fortwilliam Fruit Shop, Asda Shore Road and Iceland. “I would also like to thank all the girls at TLC who go out of their way to make this place a happy home from home environment and we look forward to having a celebration this week to mark our tenth birthday. Tender Loving Childcare (TLC) is located at 152 Cavehill Road. For more information, contact Christine Singh on 02890282249.